James Cook University scientists have helped unlock the secret to immunity to the deadly chytrid fungus, which has devastated frog populations around the world. The research is being described as a major step forward in understanding the pathogen and helping to save more frogs. While the fungus has run riot among frogs, some fortunate individuals seem to be able to live with the disease. A new paper in the prestigious journal Proceedings of the Royal Society B has identified for the first time how some frogs fight the fungus. The study was the result of 5 years collaboration between James Cook University (Lee Skerratt, Scott Cashins, Laura Grogan, Lee Berger, and Laura Brannelly) colleagues from Seoul National University in Korea, NSW Office of Environment and Heritage, and Taronga Conservation Society Australia. The study compared species worldwide – some resistant to the fungus and others susceptible – and found that resistant individuals had genes with similar pathogen-binding properties. The authors also studied the survival of frogs infected with the fungus in the lab, and found that surviving frogs had similar genes. These genes help the immune system recognise pathogens and stimulate a subsequent attack on them. Vulnerable species and individuals should now be identifiable before the disease spreads to them. Furthermore, recovery programs can be planned to breed disease-resistant amphibians for release back into the wild. “We could selectively use those individuals with MHC molecules associated with resistance to the fungus for captive breeding programs,” said Associate Professor Bruce Waldman, a co-author from Seoul National University. Dr David Hunter and the Corroboree Frog Recovery Program have managed to stop corroboree frogs going extinct by intensive captive breeding and release programs. “There are seven frog species in eastern Australia at high risk of extinction from this fungus, and all need intervention to improve their survival rates,” he said. “Breeding resistant frogs would increase the success of reintroduction by allowing us to establish sustainable frog populations in the wild,” said Michael McFadden of the Taronga Conservation Society. It appears that resistant amphibians are recognising the same component of the pathogen (called an antigen). 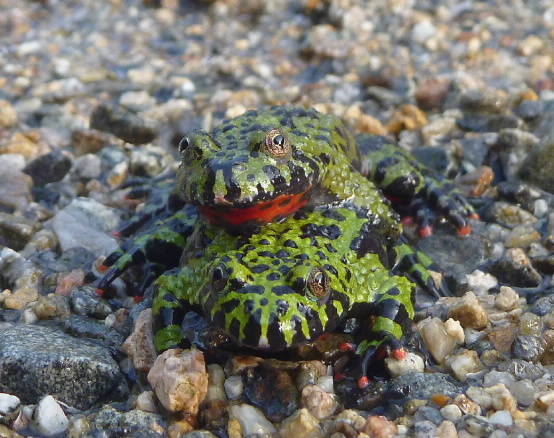 More specifically, resistant amphibians share common amino acids in three binding pockets of the MHC-II antigen-binding groove, where the receptor binds the antigen. Associate Professor Bruce Waldman, a co-author from Seoul National University, said the MHC-II molecule is like a lock. “Only specific keys can fit this lock. Antigens are pieces of pathogen that have a specific shape that complements the shape of the MHC-II molecule. The better they fit together, the more effective the immune response against the pathogen.” It appears that resistant amphibians may have developed a lock for the amphibian chytrid fungus which improves their immune response and controls the infection. Link to research and pictures: (please credit pics as listed).